Poisson brackets are at the heart of the geometric study of classical mechanics and are the focus of quantization, the passage from classical to quantum mechanics. A fundamental aspect of Poisson geometry is that a Poisson structure defines a Lie algebroid, which gives rise under suitable conditions to a Lie groupoid. This Lie groupoid then defines a geometric stack. Viewing Poisson geometry from the stacky point of view has shed much light on the subject in recent years. 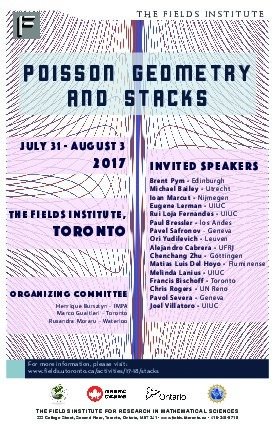 This conference is focused on the recent results in this area and aims to bring in new tools from surrounding areas, including the geometric study of PDE, affine geometry, quantization, and shifted symplectic geometry. Morita equivalence and the generalized Kahler potential.